(Nanowerk News) Chemists at Indiana University Bloomington have described the self-assembly of large, symmetrical molecules in bricks-and-mortar fashion, a development with potential value for the field of organic electronic devices such as field-effect transistors and photovoltaic cells. Their paper, "Anion-Induced Dimerization of 5-fold Symmetric Cyanostars in 3D Crystalline Solids and 2D Self-Assembled Crystals", has been published online by Chemical Communications, a journal of the Royal Society of Chemistry. It is the first collaboration by Amar Flood, the James F. Jackson Associate Professor of Chemistry, and Steven L. Tait, assistant professor of chemistry. Both are in the materials chemistry program in the IU Bloomington Department of Chemistry, part of the College of Arts and Sciences. The article will appear as the cover article of an upcoming issue of the journal. The cover illustration was created by Albert William, a lecturer in the media arts and science program of the School of Informatics and Computing at Indiana University-Purdue University Indianapolis. William specializes in using advanced graphics and animation to convey complex scientific concepts. Lead author of the paper is Brandon Hirsch, who earned the cover by winning a poster contest at the fall 2013 meeting of the International Symposium on Macrocyclic and Supramolecular Chemistry. Co-authors, along with Flood and Tait, include doctoral students Semin Lee, Bo Qiao and Kevin P. McDonald and research scientist Chun-Hsing Chen. The researchers demonstrate the self-assembly and packing of a five-sided, symmetrical molecule, called cyanostar, that was developed by Flood's IU research team. While researchers have created many such large, cyclic molecules, or macrocycles, cyanostar is unusual in that it can be readily synthesized in a "one pot" process. It also has an unprecedented ability to bind with large, negatively charged anions such as perchlorate. 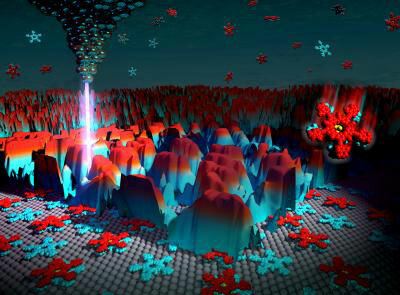 "This great piece of work, with state-of-the-art studies of the assembly of some beautiful compounds pioneered by the group in Indiana, shows how anions can help organize molecules that could have very interesting properties," said David Amabilino, nanomaterials group leader at the Institute of Materials Science of Barcelona. "Symmetry is all important when molecules pack together, and here the supramolecular aspects of these compounds with a very particular shape present tantalizing possibilities. This research is conceptually extremely novel and really interdisciplinary: It has really unveiled how anions could help pull molecules together to behave in completely new ways." The paper describes how cyanostar molecules bind with anions in 2-to-1 sandwich-like complexes, with anions sandwiched between two saucer-shaped cyanostars. The study shows the packing of the molecules in repeating patterns reminiscent of the two-dimensional packing of pentagons shown by artist Albrecht Durer in 1525. It further shows the packing to take place not only at but away from the surface of materials. The future of organic electronics will rely upon packing molecules onto electrode surfaces, yet it has been challenging to get packing of the molecules away from the surface, Tait and Flood said. With this paper, they present a collaborative effort, combining their backgrounds in traditionally distinct fields of chemistry, as a new foray to achieve this goal using a bricks-and-mortar approach. X-ray crystallography, which is being celebrated worldwide for its invention 100 years ago, can provide images of molecules from analysis of the three-dimensional crystalline solids. Scanning tunneling microscopy, or STM, developed in 1981, shows two-dimensional packing of molecules immobilized on a surface. The results are distinct, with submolecular views of the star-shaped molecules that are a few nanometers in diameter. (A human hair is about 100,000 nanometers thick).